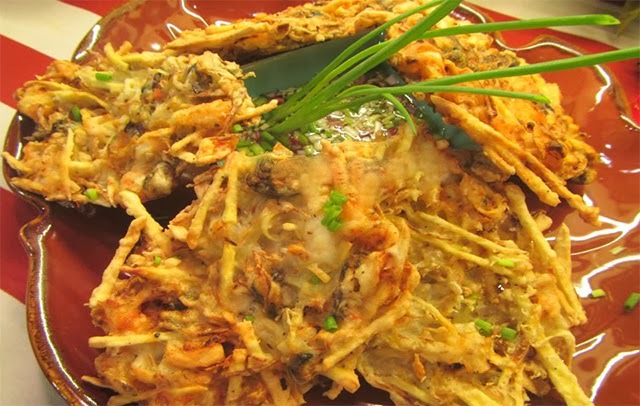 Okoy or Ukoy is a native Filipino food believed to have originated from the province of Laguna. It is a popular afternoon snack in the Philippines, though some use it as viand for regular meals. Other than shrimp, usual ingredients used in making okoy includes bean sprouts and tofu. This variation was mixed with swahe, tahong and sweet potatoes and is deep fried to perfection to give it its distinct crisp. 3. In a frying pan, heat cooking oil and pour about ¼ cup of the mixture. 6. In a bowl, mix all the ingredients for spicy garlic vinegar dip.